Apple EarPods claim to rival high-end headphones | What Hi-Fi? Apple has upgraded its infamous earphones, launching the Apple EarPods, designed to sit within your ear and promising to rival headphones "that cost hundreds of dollars more""
Apple has upgraded its infamously average earphones, unveiling the new Apple EarPods at the launch of the iPhone 5. Apple bullishly claims that the new EarPods' "audio quality is so superior, they rival high-end headphones that cost hundreds of dollars more". The design of the new EarPod earphones claim to be "defined by the geometry of the ear", and will sit slightly further inside the ear than the old-style Apple buds. Apple also claims that they have been engineered to minimize sound loss, which is a common complaint with previous models of the headphones. 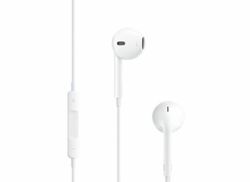 The EarPods will come with the iPod touch and iPod nano or will cost you £25 for EarPods with in-line mic for voice calls and remote control. The remote and mic are supported by all models of iPod, iPhone, and iPad (not all models support volume up/down functions). Audio is supported by all iPod models.Requires software version 1.0.3 for iPod nano (4th generation), 2.0.1 for iPod classic (120GB), and 2.2 or later for iPod touch (2nd generation).